Lawn diseases make most people cringe. They don’t want to deal with the problem. Well, if you follow a few steps that we suggest, you shouldn’t have to worry about them. Lawn diseases are preventable with some diligence and good lawn care. In this blog post, we’ll delve into the activities you should be taking to keep your lawn in good condition. Select the appropriate lawn grass to avoid lawn diseases. Having the right grass for your climate, anticipated use and maintenance level is important. 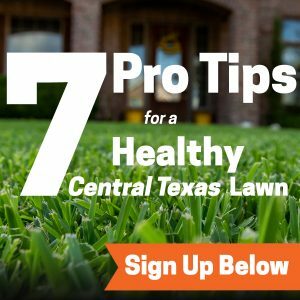 In Central Texas, we use Bermuda grass, St. Augustine grass and Zoysia grass for the most part. Each grass is geared toward the climate. Know that disease is most likely to strike these warm-weather grasses in the spring. The best thing you can do is to observe your lawn weekly for any sign of damage or decay. Yes, if you are an active observer of your lawn, you’ll notice when something is amiss. You can contact us at Emerald Lawns and we’ll be happy to take a look at it for you and begin treatment as necessary. Checking your lawn regularly can mean a world of difference especially if you spot disease early. That way it won’t spread as much and you can more easily contain it. Mow the grass when it’s dry and mow to proper cutting height. No more than 1/3 of the blade should be reduced at any time when you mow. Keep your mower blades sharp so that you’re not ripping and tearing the grass. Make sure your lawn gets plenty of air. Don’t let the leaves build up on your lawn more than an inch thick. If you have thatch, de-thatch the lawn. You can use a rake to lift up the offending thatch. Another good thing to do is to make sure your lawn is aerated. Disease most often happens in spring and fall. Aeration is great to reduce soil compaction and improve drainage. Improving drainage and aerifying the soil greatly reduces the odds of a lawn becoming diseased. At Emerald Lawns, we perform a Core Aeration service with a lawn aerator to poke holes in your lawn so that water and sunlight get through to all levels of your lawn. This will keep your lawn healthy. Not only does aeration bring air to the lawn, but the plugs of soil we leave on the lawn go back into your lawn and nourish it naturally. It’s a win-win. We know that you can’t always avoid a lawn disease, but you can do some things to prevent it. At Emerald Lawns, we have lots of ways to help you prevent lawn diseases. We’re happy to help. Give us a call at 512-990-2199 for more information.